Tall Pines is a private cottage, newly remodeled in winter of 2015, located in the midst of a 22-acre hardwood forest. Pearl, an 800-acre spring-fed lake, is a virtual wildlife preserve, with bald eagles, blue heron, and loons nesting here. The swimming, kayaking, fishing, and hiking are excellent. boats are available, including two paddle boats, rowboat and canoe. A pontoon boat and bass boat are available as a per-day rental. Private sand beach. New air conditioning unit. Comfortable living room with big-screen TV. Dining area and well-equipped kitchen with dishwasher. Linens, towels, and other amenities are furnished. A large deck surrounds the cottage, great for catching beautiful sunsets. The cottage has an open floor plan. There is a queen-size bed in an alcove, with a screen separating it from the living room. There is a king-size trundle bed on the four seasons porch. There are two bedrooms, one with queen-size and one with double bed downstairs, and three full baths with showers. The upper floor has two bedrooms with queen-size beds and a large sitting area with TV, an excellent haven for grandparents, and a quiet space for young children to nap. Amenities: TV/VCR, dishwasher, washer and dryer, rowboat, bass boat, canoe, paddle boat (pontoon for rent). Activities: Swimming, boating, fishing, shopping at the renowned specialty stores in Traverse City, golf, horseback riding, fine dining in Traverse City, fun dining in Interlochen, and a fine Interlochen summer program. Area: Pearl Lake is 20 miles from Traverse City and 16 miles from Interlochen. There is a well-equipped grocery/general store in Lake Ann, 2-1/2 miles away. 500 feet of lakefront on Pearl Lake, the "secret lake of Benzie County", with sandy beach, sand bottom, fed by artesian springs, with clear, warm water and gradual descent into deep water. Large french-door refrigerator with large freezer and ice maker. Full kitchen with new gas stove, dishwasher, and large refrigerator with ice maker - towels and cleaning soaps and materials included. An exceptional experience we have already booked, again! We absolutely loved our experience here. 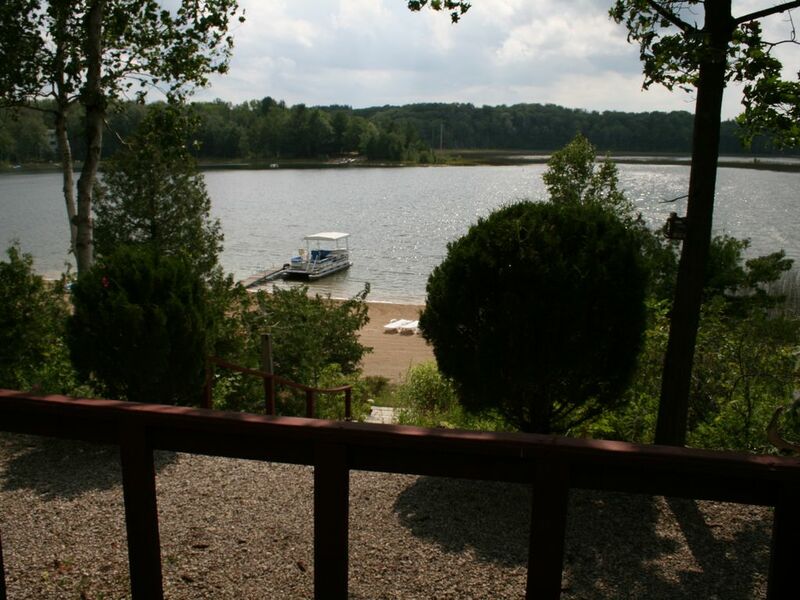 It is a lovely setting with privacy and walk-out access to go kayaking, swimming, taking a pontoon ride around Pearl Lake, and paddle boarding. You can bring your own kayaks and paddle boards, or have them delivered from a nearby rental source. Highly recommend sunrise kayaking -- absolutely beautiful! The sunsets are spectacular, too, with several outdoor seating options to experience -- or experience inside with lots of windows that allow easy viewing. The cottage is absolutely charming -- was so impressed with the care the owners have taken to provide a nice environment . There is lots of room, and loved the colorful decorating and all the windows. Really important -- the couches are comfy and there are nice areas to have game and movie nights. The owners couldn't be more friendly and accommodating! Our dog, Max, is older and having a hard time with stairs. The owner made a ramp for him to go up the 3 stairs to the deck, and always available for any questions or requests. Finally, it is a convenient location -- easy to get to Traverse City, Glen Arbor and our favorite beaches near Empire -- all are only about 20 min. driving time. The town of Lake Ann is a great place to spend some time as well. This is a location we will book, again -- in fact, we have already booked for another week! We're enchanted with Pearl Lake, and so pleased to be able to share "one of Michigan's best kept secrets" with our fellow travelers. Thanks so much for letting us know how you've enjoyed your time here! Whatever you need for a good time, this cottage has got it. Private beach, private dock, fire pit, four different boats to sail at your leisure, and a well decorated interior to boot, this place has got it all. 10/10, had an excellent time and would stay again. We spent a nice week at the cottage. House was well stocked with most of what we needed. Val and Mark live right next door and Mark came right over when we had an issue and took care of it right away. The kids had a great time fishing from the dock and caught a lot of fish. The boats were nice to paddle on the lake. The "upstairs" bedroom & family room/kitchen are actually in a separate carriage house, which wasn't clear in the description. A bit disappointing that we weren't all in the same house as we were expecting. The 2 beds downstairs, along with the laundry room, were not easily accessible as there is a tight spiral staircase which made it difficult to carry luggage and laundry down. There is a door that one can access the basement through from the outside if needed. The lake was beautiful, although too mucky for our group for swimming, but Lake Michigan is a short drive away and one can never go wrong with a drive in that area..beautiful! We enjoyed time on the big deck, with plenty of seating and daily songs from the loons. Owners were very friendly. Location was beautiful, very private & peaceful. House was clean, kitchen well equipped. It has a quirky layout that lacks a bit of privacy but it worked well for our family of 6. Had access to several different boats which everyone enjoyed. Pearl Lake borders on the Pere Marquette Forest, and is a virtual wildlife sanctuary, with loons, bald eagles, osprey, sandhill cranes, blue heron, and many species of shorebirds. The lake is sheltered from extreme weather by the large hills surrounding it. Weekly rate is $2,750. $500 deposit holds the cottage and functions as a damage deposit. It is returned when grounds and unit are inspected at the end of visit. Reservation deposits will be fully refunded greater than 60 days prior to check in upon cancellation. 50% of deposit will be returned upon cancellation between 31 and 60 days prior to check in. No return of deposit within 30 days of check in. No refunds for early check out. Check in is Saturday 5 pm with check out the following Saturday 10 a.m.